POLARIS POINT, Guam - After five-and-a-half years forward deployed to Guam, the Los Angeles-class submarine USS Buffalo (SSN 715) departed for her new homeport of Pearl Harbor, Hawaii, Jan. 11. 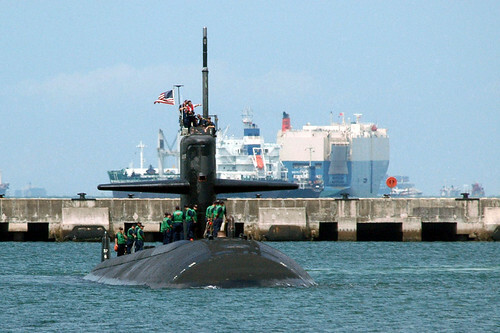 Buffalo is the third submarine to change-out in Guam in the last two years. The change-out comprised of USS City of Corpus Christi (SSN 705) with USS Oklahoma City (SSN 723), USS Houston (SSN 713) with USS Chicago (SSN 721), and USS Key West (SSN 722) with USS Buffalo. After arriving in Hawaii, Buffalo and its crew will take part in a scheduled extended maintenance period and mission availabilities. “Transition is something that every submarine must go through. We have been training and preparing for the maintenance period for several months and I am very confident in my Sailors’ readiness for the challenges of the shipyard,” said Seif. While attached to Guam, Buffalo conducted 11 missions vital to national security. As diplomats of the United States, the submarine crew participated in port-calls visiting Australia, Philippines, Republic of Korea (ROK), Saipan, Japan, Singapore and Thailand. Buffalo also participated in eight multi-national exercises, working with Japan, Australia, ROK, and Thailand, to include OPERATION Valiant Shield, Undersea Warfare Exercises (USWEX), Security Exercises (KILOEX), and Cooperation Afloat Operation and Training (CARAT) exercises. Buffalo is one of several ships to bear the name USS Buffalo. She was built at Newport News, Va., launched in 1982, and commissioned in November 1983. She has won many honors and awards and on several occasions was recognized as the best submarine in Submarine Squadron 15 for Battle Efficiency. USS Buffalo is the 2011 Pacific Fleet Arleigh Burke Fleet Trophy Award recipient for superior performance and improved battle efficiency.